Mr. Leslie Bassett is a composer of orchestral, chamber, choral, vocal, piano and organ works that have been performed in the Americas, Asia and Europe. He is considered one of the most important American composers in recent history. Born in Hanford, California, Mr. Bassett studied piano, trombone, cello and other instruments, then served as trombonist, composer and arranger with the 13th Armored Division Band in the United States and Europe during World War II. Mr. Bassett received his BA degree from California State University, Fresno and went on to study composition at the University of Michigan. He was granted a Fulbright Fellowship to Paris and continued his composition studies at the Ecole Normale de Musique de Paris. He has been a member of the American Academy of Arts and Letters since 1976 and has earned grants from the Koussevitzky Foundation, the National Endowment for the Arts and the Rockefeller Foundation. His Pulitzer Prize-winning composition, “Variations for Orchestra,” represented the United States at the 1966 International Rostrum for Composers in Paris and has been widely performed. Renowned orchestras have commissioned and performed his works. A teacher at heart, Mr. Bassett taught music composition at the University of Michigan from 1952-91, where he was chair of the composition department from 1970-88 and the Albert A. Stanley Distinguished University Professor of Music from 1977-91. He is also a co-founder of its electronic music studio and its contemporary Directions Performance Ensemble. Mr. Bassett returned to Fresno State as an instructor for the 2000 California State University Summer Arts Program and remains connected to the Department of Music. It is his way to give back, attest to the consummate love of his work and help others achieve their highest personal goals. 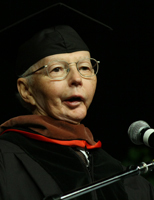 In recognition of these achievements and his unwavering commitment to bettering the region, the Board of Trustees of the California State University and California State University, Fresno are proud to confer on Leslie Bassett the honorary degree of Doctor of Fine Arts.